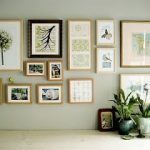 An Attractive way to display your photos in your home is in a collage. Not only are they visually appealing , but they also serve as a unique way of telling a story with pictures. You can make a collage that documents a trip, a memorable day or a period of time in your life, or you can make a collage that features pictures throughout different periods of your life, serving as a visual timeline. Place a poster board on a flat surface. Decide whether you want to position the poster board in a vertical or horizontal position. Decide which photos you want to feature in your collage. Lay the photos on the poster board, determining the best way to layout the collage. One idea is to choose your favorite photo or the picture that best sums up the collage and place it directly in the center. 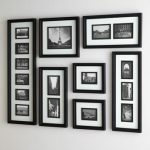 Surround the center picture with accent pictures or pictures that help tell the story of the collage you are creating. For instance, if you are creating a collage that documents a vacation, place your favorite photo in the center of the arrangement and surround it with other pictures from your trip. Try different arrangements to see which look you like best. Crop the photos. You may want to scale down the size of some of the photos, or remove items that were capture in the photo that are not pertinent. Use a straight edge and a pen to frame out the portion of the photo you want to keep. Use a pair of scissors to cut around the frame you have created. Attach the photos to the poster board. 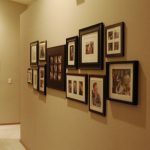 With the pictures in the arrangement that you have choose, flip one picture over at a time, rub glue on the back and flip the pictures back over to secure them to the poster board. Placing the collage in the picture frame will give it more finished look. It will change the total framing of interior space.